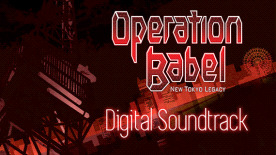 This product requires the base game Operation Babel: New Tokyo Legacy. When a mysterious object - dubbed ‘the Embryo’ - appears in the sky, the CPA and the Xth Squad are mobilized to face the new threat. Venture into challenging new labyrinths and create the perfect team to challenge each threat. Featuring a mysterious new story, unprecedented character customization through the new ‘Sub-Blood’ system, and item-based character ability modifications, Operation Babel: New Tokyo Legacy will give you a world to lose yourself in. Extensive Character Customization - Expanding on Operation Abyss’ Blood Code system, you’ll now be able to assign characters supplemental Blood Codes to create hybrid job classes. Item-Attached Skills and Spells - Add new skills and spells to perfect your squad by equipping items that bring with them new abilities. Balanced Challenge and Reward - With the return of the Rise & Drop system you’ll be able to recover increasingly powerful drops - if you’re willing to risk increasingly powerful enemies. A New Operation to Complete - After a short period of peace in near-future Tokyo, dive into the battlefield once again and continue the story of the Xth Squad in a new mysterious adventure. ©EXPERIENCE ©MAGES./5pb. Licensed to and published by NIS America, Inc. All rights reserved. Please note: This content requires the base game Operation Babel: New Tokyo Legacy in order to play.